Project Gift Compassion, initiated by Adhya Educational Society, is an empathy project that brings schools across the city of Hyderabad, India on a single platform. The project aims “to overcome the social barriers existing in the society and to facilitate the idea of sharing and the act of giving” among young and impressionable minds. “Gift Compassion” is designed to engage schools (both in the public and private domains), teachers, children, and parents in the creation of a gift economy that traverses barriers of caste, creed, gender, socio-economic status, etc. An exchange of a small gift prepared by a child from one strata of the society with another from a different community and background builds a bridge of compassion, hope, and trust for each other. In principle, voluntary and recurring gift exchange both create and circulate compassion, empathy, social consciousness, and build a community. All the participating schools were teamed up with a buddy school where the children from the respective schools made a gift (of their own choice). Gifts made by children ranged from Origami (art of paper folding), recycled gifts from plastic bottles, hand stitched folders, handmade books, greeting cards, drawings and crafts. The children of a government zilla parishad school in Mahboobnagar grew fruits for their counterparts! Each pair of schools was asked to visit the other and exchange the gifts made by the children on any day during the Joy of Giving Week, 2012 (October 2nd – October 8th). 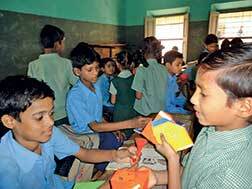 Empathy project, Gift Compassion was implemented across 40 schools reaching 10,000 children, involving schools and children from every corner of Hyderabad including the most sensitive areas in the Old City with a focus on building bridges among schools and communities. It has been a fantastic journey! For successful execution, the project was implemented in three phases with each phase having its own significance; during phase one, the ideas behind the Joy of Giving Week and Gift Compassion Project were introduced to the management, children, and parents of the participating schools and this was followed up with gift making by children. About 20-25 children from each school took all the gifts made by children of their school and visited their buddy school and exchanged gifts. The group of visiting children went from class to class and spoke about themselves, asked questions, made friends and found out about the hosts. The exchange did not just include an object but instead was an exchange of ideas, stories, and awareness about multiple dimensions of life. The gift exchange led to the development of an understanding of each others’ lives, socio-cultural backgrounds, aspirations, dreams and hopes. Phase two focused on the reflections by the children, management, and teachers on the gift exchange. 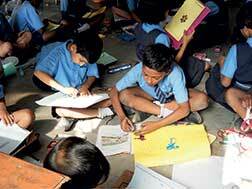 The reflection session was held at every participating school on a chosen day and the session lasted for a maximum of four hours. Since the learning philosophy at Adhya is based on Arts Based Learning and Teaching, the reflection sessions also used art as a means of interpretation of the varied experiences that the children underwent during the first phase. After a wonderful experience of awareness, thinking, and learning followed by reflection, children from some of the schools talked about their exciting journey and shared their valuable memories over Bol Hyderabad, a community radio station housed in the University of Hyderabad. Students from one government school who went to another school said that they “liked the people there, saw a new place, learned how to respect and behave with others, met new people, learned how to be happy and make others smile.” A student from a private and underserved school who visited another private and underserved school said that he would “want to experience more such trips”. We have been informed by all the teachers from the participating schools that the children savoured every moment they spent on making the gifts and that children unleashed their creativity in thinking up the gifts. A documentation of the entire project leads us to report that during the exchange of gifts, children mingled with one and another, shared their lunch boxes, made new friends, spoke about their dreams, inspired one another in their own ways and enjoyed “giving” in the true sense. This profile, first appeared in Teacher Plus, August 2013 and is a part of the "Interventions" series. The authors are student and teacher development specialists working in the area of K-12 education. 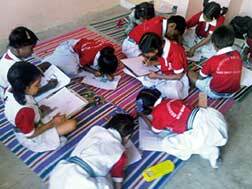 Madhulika.S is a researcher, teacher, artist, development worker and the founder of Adhya Educational Society. Deepti Gollapudi is the outreach coordinator at Adhya Educational Society; she coordinated project Gift Compassion. Great initiative by Adhya Education Society. Special congratulations to Madhulika S. and Deepti Gollapudi. I wish if you can spread this idea around the other states of the country.